In response to recent events of repression of students of the Normal Rural of Ayotzinapa, Guerrero, perpetrated by police officers on September 26th, we unite our voices to those of the relatives of the disappeared who are asking for the presentation alive of their sons and for trial and punishment for those responsible of the crimes. We will have a solidarity and denounce demonstration outside the Embassy. Today, for all those who are looking for their disappeared beloved ones and for those who dream with a Mexico where human rights are respected, our voice matters. Students from the Rural Normal School ‘Raul Isidro Burgos’ in Ayotzinapa, Guerrero, were first attacked by the municipal police at Iguala while they were gathering in an event to collect funds to attend the commemoration of the Tlatelolco massacre, 1968 and of two other students from the same community murdered in 2011. Mexico is now in the midst of a humanitarian crisis. This is evidenced by cases of violence taking place in the country over recent years, and has also been confirmed by various international organizations specialized in Human Rights. 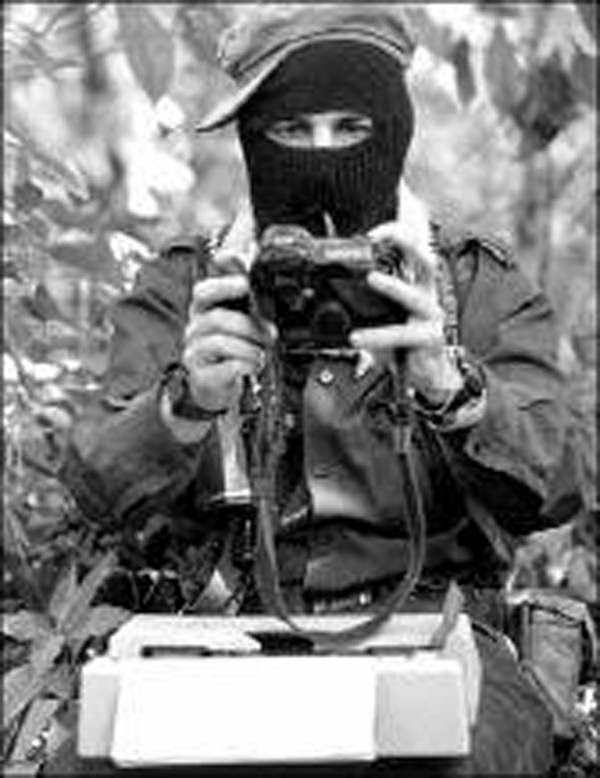 In one of the more recent cases of violence, students from the Rural Normal School ‘Raul Isidro Burgos’ in Ayotzinapa, Guerrero, were attacked on Friday September 26th by municipal police of Iguala when collecting funds to attend the commemoration of the Tlatelolco massacre, 1968. In the attack, the municipal police killed two students and three more people that were passing by. 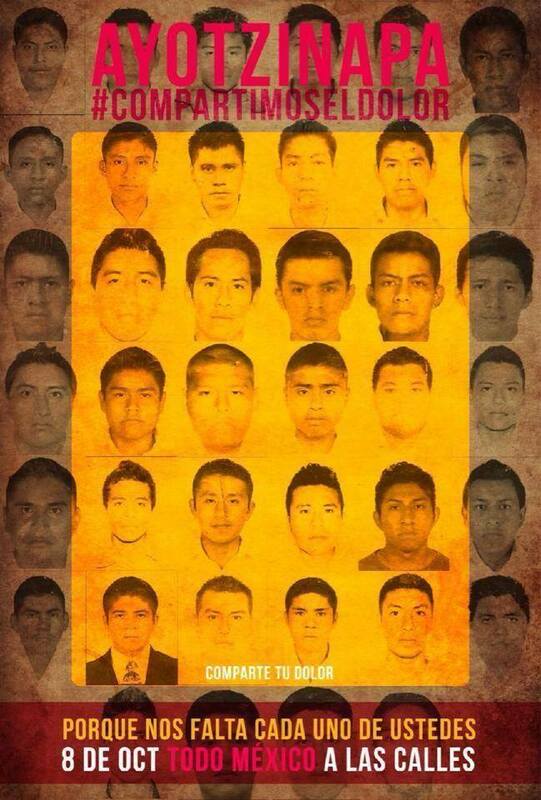 43 students were disappeared, and since then there has not been information of their whereabouts. The next day, another student, Julio César Mondragón, was found with signs of torture and with his face flayed. Last Saturday, clandestine mass graves were found near Iguala. According to the State government, some of the bodies could correspond to the disappeared students. The attack on the rural student is not an isolated event in Mexico. It is the result of a context in which the offenses committed by entities of the state have been systematically ignored: attacks, murders and enforced disappearances have been conducted with impunity, without prosecution and punishment of those responsible. This allows the government to respond to the demand for justice made by families of the disappeared students with a disorganized search that does not respect international protocols, to constrain information and to respond with a lack of sensitivity to the relatives. The physical violence executed against students is then complemented by the violation of the rights of their parents, their wives, their brothers and sisters. Rural Normal Schools have historically been characterized by admitting children of farmers that study to develop community work while teaching in rural areas. Being young, students, and farmers, they aimed at transform and enhance the most deprived areas of the country; for this they have been killed, tortured and disappeared. Being young, students, and farmers, they aimed at dignify the poorest Mexico; for this their dignity has been threaten. The families of student that were killed and of the disappeared students are calling for Mexican society to show their solidarity in a national demonstration. 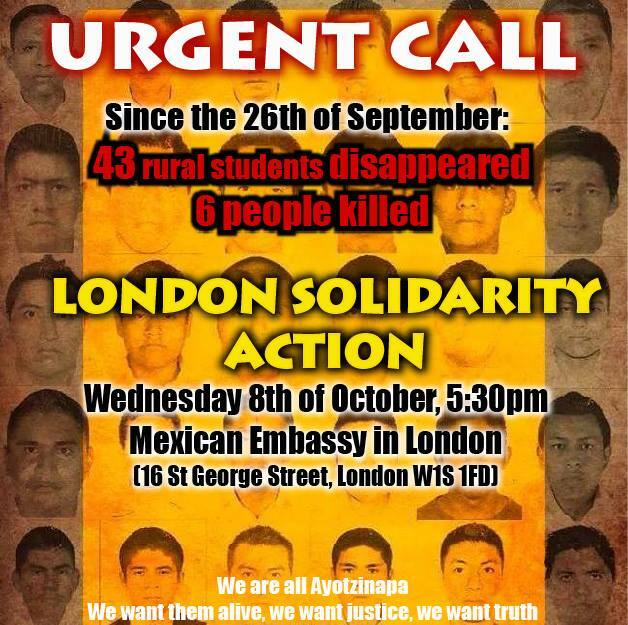 This calling for gives the opportunity to those of us living abroad to transform the distance from Mexico into a speaker that unifies our demands: responding to their call against impunity, oblivion and silence, we urge you to join us at Mexico’s embassy in London for the presentation alive of our 43 fellow students, next Wednesday 8th at 5:30 pm. At a time when silence, indifference, and fear are the best accomplices to impunity and injustice, the disappearance of the students of Ayotzinapa requires other Mexican students to publicly denounce these crimes, to make them visible, underline the responsibility of the Mexican state, and claim for trial and punishment of those responsible. As students abroad we have the ineludible responsibility of breaking the silence that perpetuates impunity in our country. That’s why we exhort students and Mexican student organizations in the UK to raise their voices in the face of this tragedy. Today, for all those who are looking for their disappeared beloved ones and for those who dream with a Mexico where human rights are respected, our voice matters. They took them alive! We want them alive!